Sean Kingston is now in the middle of The Game’s beef with Meek Mill. 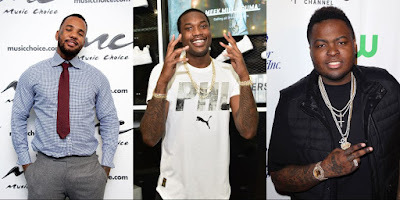 According to TMZ, the feud seems to be connected to an incident where Sean was robbed at an L.A. club and The Game accused Meek Mill of pointing the cops towards him following the robbery. Sean took to Instagram to suggest Meek was not involved at all and that was when the feud between him and The Game seemed to have started. The Game told his side of the story in an Instagram video, reiterating that Meek had snitched, Sean was lying, and once again insisting that he and Meek will be brawling in the near future. According to him, it was Sean’s own people who set him up for the robbery, and Meek gave Sean the idea it was The Game’s team, which then got the cops on his case. Not long after that, Sean replied with his own words for Game, claiming that people affiliated with Game hit him over the head with a bottle before taking his jewelry. However, he mainly took the opportunity to hurl insults at the rapper. “You 43 years old, still trying to do music,” he said, before arguing that The Documentary is The Game’s only good album and that was just the beginning.